My 3 year old, Kiara, loves to make breakfast with me each morning. She stands up on her white stool at the island and “helps” me, usually by sticking her fingers in the jelly jar. This little one has quite the spirited personality, and she likes her breakfast a very particular way. This way changes every morning, and if I don’t read her mind correctly, she throws a little hissy fit. Which, generally, is every morning. 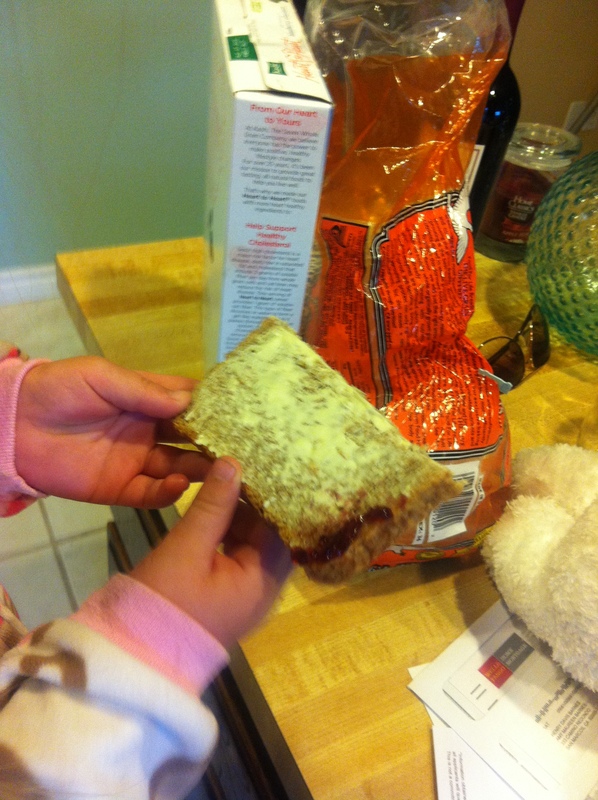 This morning, she wanted her toast like this: cold sprouted sesame bread, vegan butter, and just a tiny bit of jelly on one corner of the bread…. I was not allowed to show her face because she was hysterical while I took this shot. I spread the jelly a little too far for her and it touched the butter. About 4 minutes later she started crying because I didn’t give her enough jelly. Aaahhhhh…..the joys of parenthood! I love it. We are so like this precious little three year old. We decide how much God we want and where we want Him. If he spreads a little too far into our lives, we scream, “HEY! Not on my butter!” We change our minds daily about how much of Him we’ll allow. Sometimes he gets spread all over, sometimes He gets the tiniest crumb of a corner, and sometimes we don’t want any of Him at all. Then we schizophrenically scream at Him minutes later for not being there, the spot we didn’t want Him in the first place. It seems to me that many believers kind of hit a weird block. We receive Christ, we love what He’s done for us, we know that He loves us, and that is kind of…..it. We’ll nominally call ourselves “Christians,” but we can’t quite push past this block of control…wanting to give Him some little corners, but managing quite well without Him in the others, thank you very much. We’ll take the “please keep my kids safe” corner, or the “please heal so-and-so” corner, or the “please give us money for such-and-such” corner. We leave out the “I have been crucified with Christ. It is no longer I who live, but Christ who lives in me” (Gal 2:20). We hush the “If anyone would come after me, let him deny himself and take up his cross and follow me.” We push out the “whoever would save his life will lose it, but whoever loses his life for my sake will find it” (Matt 16:24-25). And we turn up our noses at the “we rejoice in our sufferings” thing (Rom 5:3). As children, you learn “Jesus loves me, this I know, for the Bible tells me so.” This is awesome for kids to know, but a lot of us stop there. We don’t push for anything more. It ends with Jesus loves ME, and I love Jesus. The heart of the gospel is missing. The truth is, that God is so IN LOVE with you that He humiliated His Son to death for you and me, stinky old sinners. In return, we are to be so IN LOVE with Him that our entire lives are surrendered to Him. Big difference. I love popcorn. I’m in love with my husband. 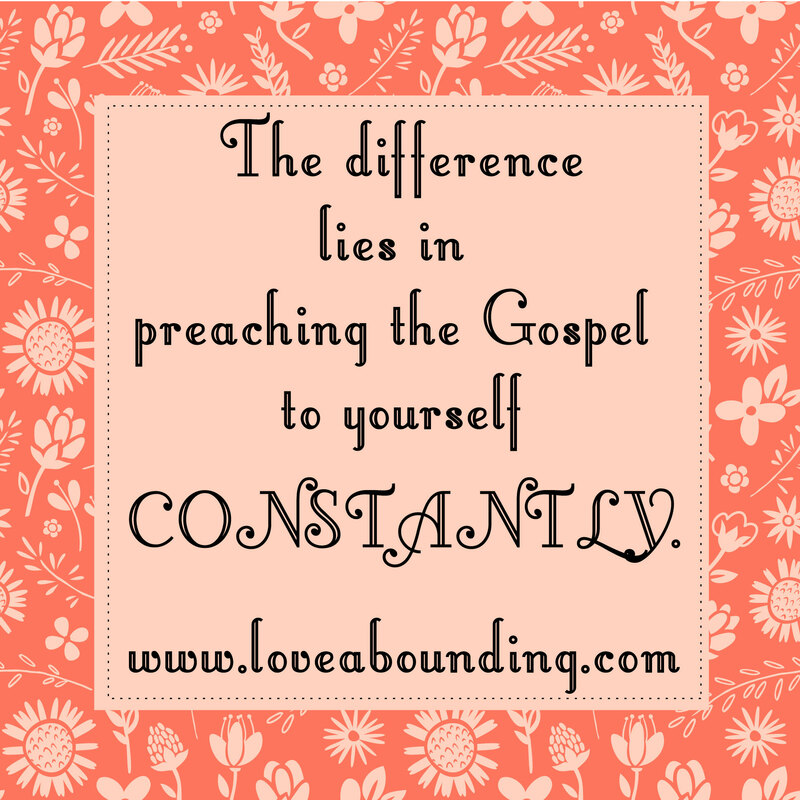 The difference lies in preaching the gospel to yourself c-o-n-s-t-a-n-t-l-y. Invest in your relationship. Don’t treat Him like popcorn. 1 Corinthians 6:19-20 says “You are not your own, for you were bought with a price. So glorify God in your body.” He bought you. He paid for you. It’s a great dichotomy– you were a slave to sin, and now you’re free in him. At the same time, you were free to sin, but now you’re a slave to him. You are not your own. When you try to be, you’re stealing from Him. He paid for you. You are now His bondservant. His slave. But strangely, that’s where the freedom truly lies. “For freedom Christ has set us free” (Gal 5:1). Go ahead and spread yo’ jelly aaaaaall over that toast this mornin’. Why do so many of my posts have to do with food? This entry was posted in Uncategorized on January 17, 2013 by Amy Barnes. I love that little Kiara, and I love your sense of humor and undeniable love for the Lord. Love it all!